(Los Angeles, California - November 28, 2012) –The all-new 2013 RAV4 crossover SUV made its world debut today at the 2012 Los Angeles International Auto Show. 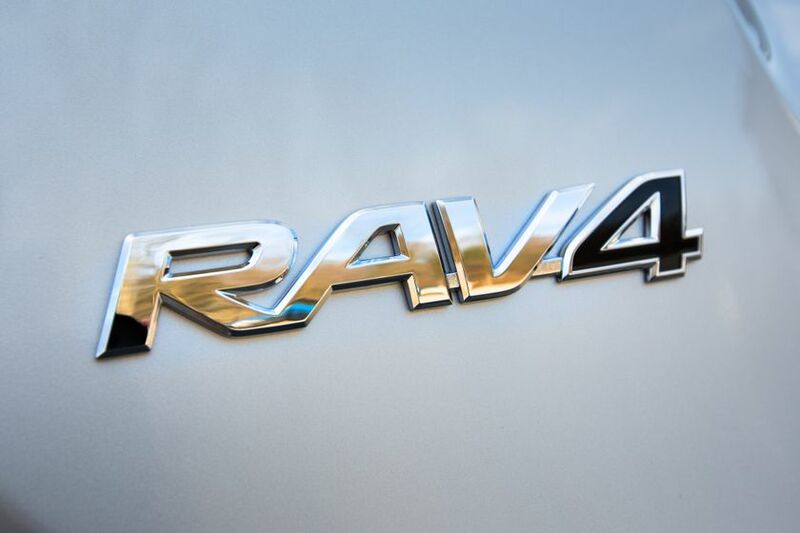 Toyota’s fourth-generation RAV4, the world’s original crossover sport utility vehicle, arrives early next year. With a fuel-efficient four-cylinder engine, new six-speed transmission, two-row seating for five, and a host of available in-cabin technologies, RAV4 offers a nuanced balance of performance and all-around capability, including striking design, class-leading eight standard airbags, and a compelling array of standard features. RAV4 will be available in three well-equipped grades: LE, XLE, and Limited. 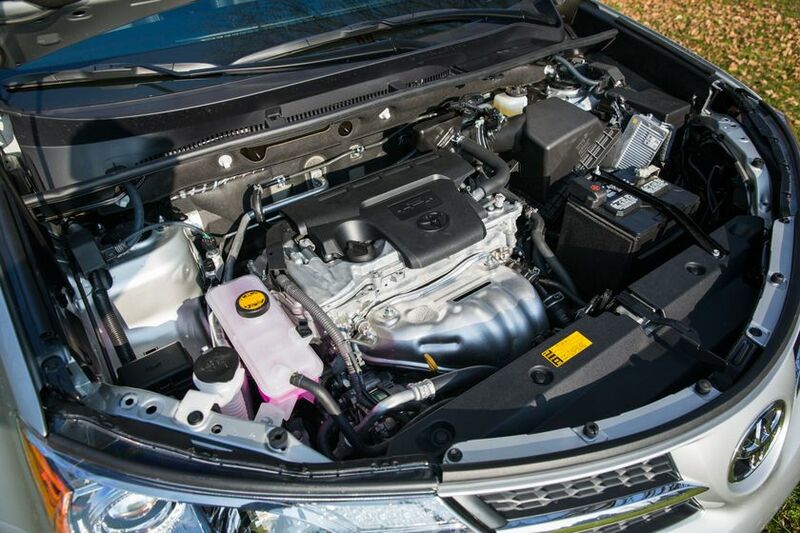 For 2013, RAV4 will provide a number of powertrain technologies that help deliver an engaging driving experience. It will feature Toyota’s 2.5-litre four-cylinder, which will produce 176 horsepower at 6,000 rpm and 172 ft. lbs. of torque at 4,100 rpm. 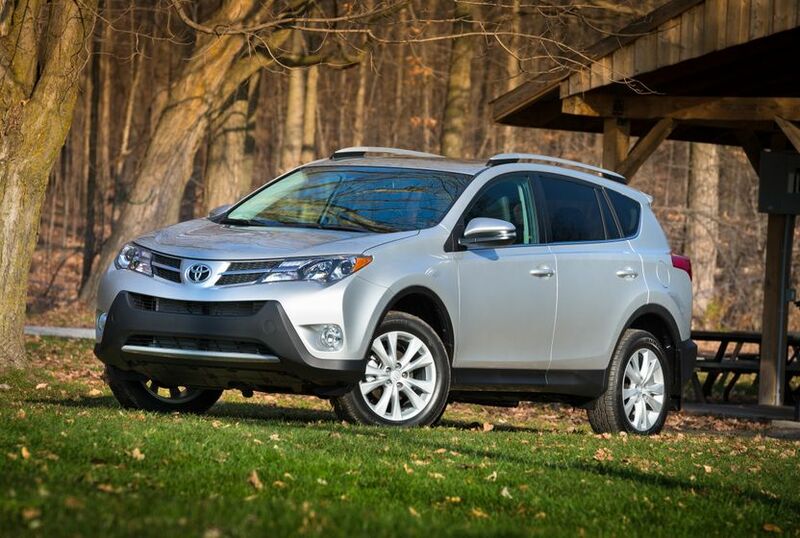 The optional V6 of the previous-generation RAV4 will be discontinued. 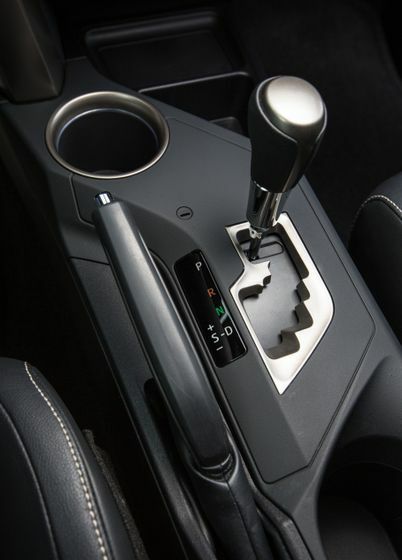 Replacing the previous four-speed automatic will be a six-speed transmission with Sequential Shift. First and second gear ratios will be optimized for around-town performance. To keep engine revs lower at highway speeds and enhance fuel mileage, fifth and sixth gears will be overdrives. 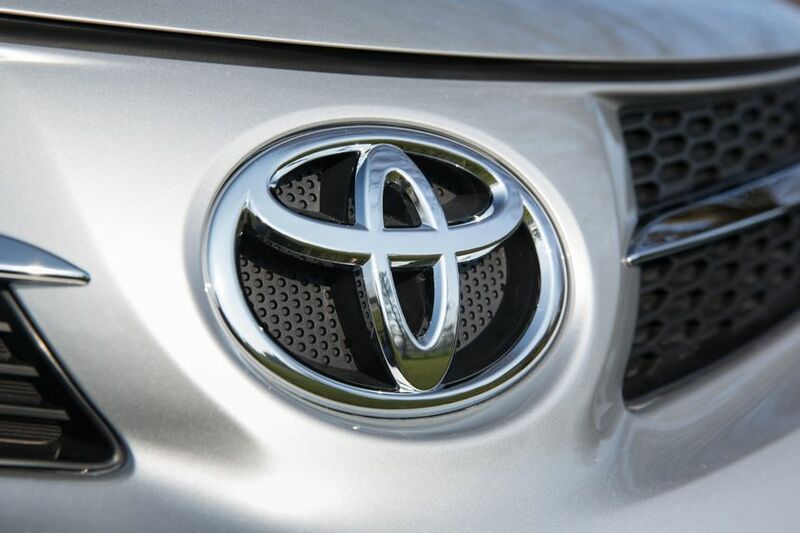 RAV4 front-wheel-drive models have received estimated fuel efficiency ratings of 8.7L/100km in the city and 6.4L/100km on the highway, while LE and XLE all-wheel-drive models are estimated at 9.1L/100km in the city and 6.8L/100km on the highway. A new Eco mode is designed to promote more efficient driving thus helping to enhance fuel efficiency. The new RAV4 will provide its active owners a more dynamic drive, with new technologies like Sport Mode, enhancements in suspension performance, and optimized electric power steering. The spring rates have been optimized, and the shock absorbers have been optimally tuned to help the vehicles handling characteristics. RAV4 has a MacPherson strut front suspension, double-wishbone rear suspension and four-wheel disc brakes. The LE will ride on wide opening 17-inch steel wheels with wheel covers, XLE will feature 17-inch alloys, and Limited will be equipped with 18-inch alloys. 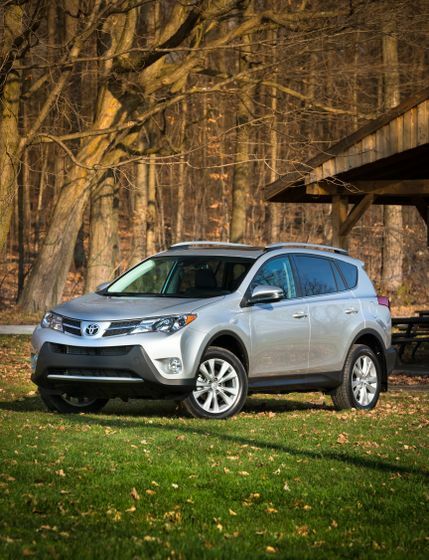 In both front- and all-wheel drive RAV4’s, Sport Mode sharpens shift timing, throttle response and steering response. 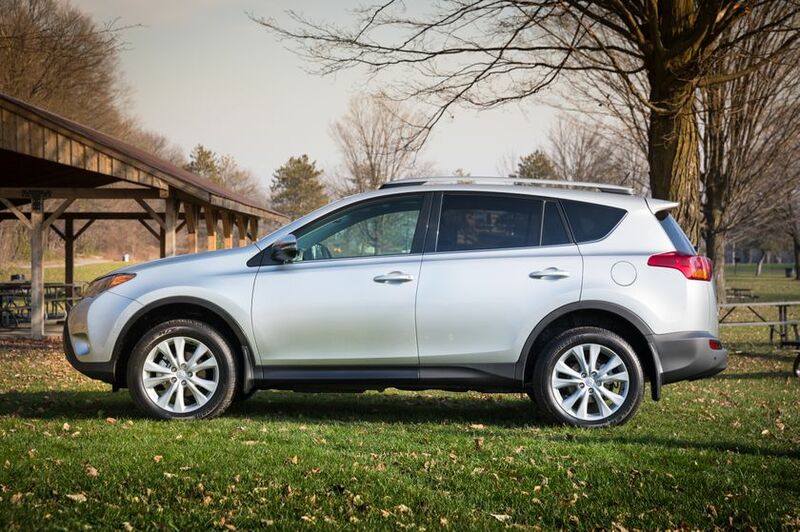 When down shifting the RAV4 six-speed automatic transmission in “S” Mode, engine revs rise with a clearly audible “blip,” adding to the driving experience. 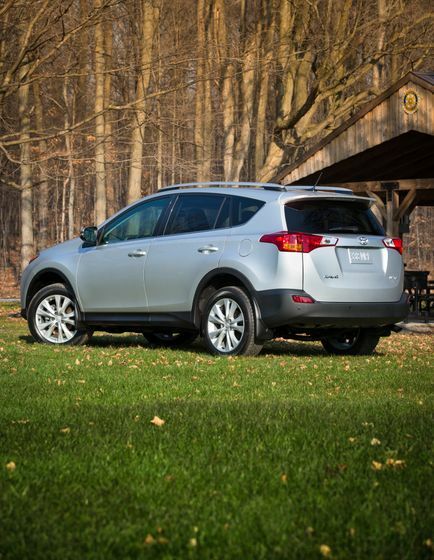 In RAV4 with AWD, Dynamic Torque Control AWD has additional benefits. When turning into and through a corner, power is sent to the rear wheels to help enhance cornering performance, detecting steering angle and lack of yaw rate in Sport Mode (and detecting lack of yaw rate in Normal and Eco Mode). 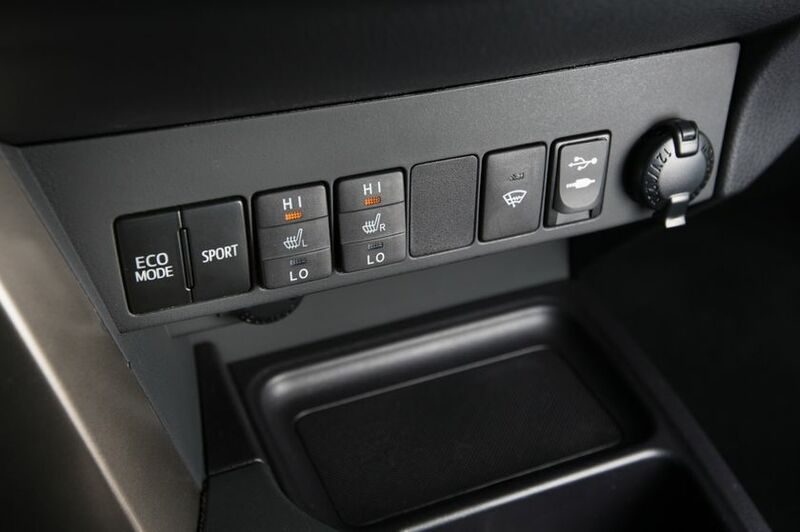 Dynamic Torque Control has three difference drive modes: Auto, Lock and Sport. In Auto Mode, RAV4 delivers power primarily to the front wheels under most driving conditions, switching automatically to AWD only when needed. By only engaging the rear axle and delivering power to the rear wheels when needed, Auto Mode helps enhance fuel efficiency and reduce drivetrain wear. 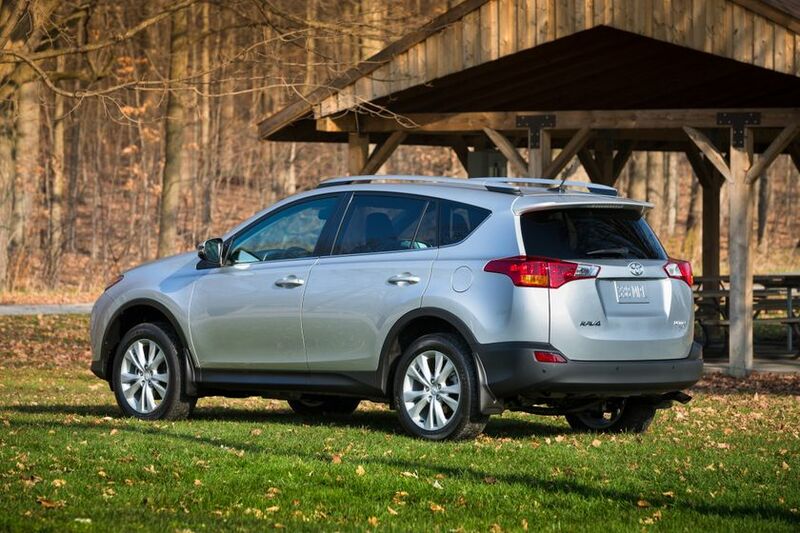 In Lock Mode at lower speeds, RAV4 essentially has a full-time AWD system with power delivered to all four wheels. 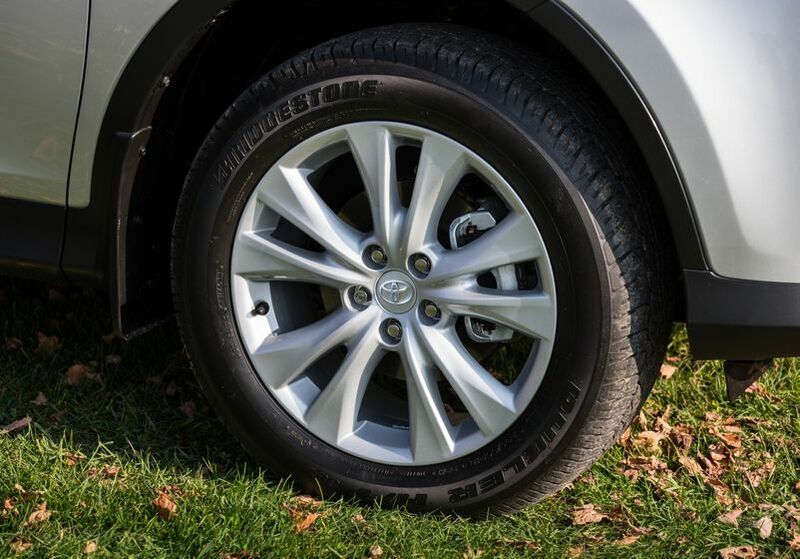 At speeds below approximately 40 km/h in Lock Mode, up to 50 percent of engine power is sent to the rear wheels, enhancing traction and helping RAV4 “dig” through sandy or muddy conditions. Lock Mode reverts to Auto Mode when vehicle speed passes approximately 40 km/h. 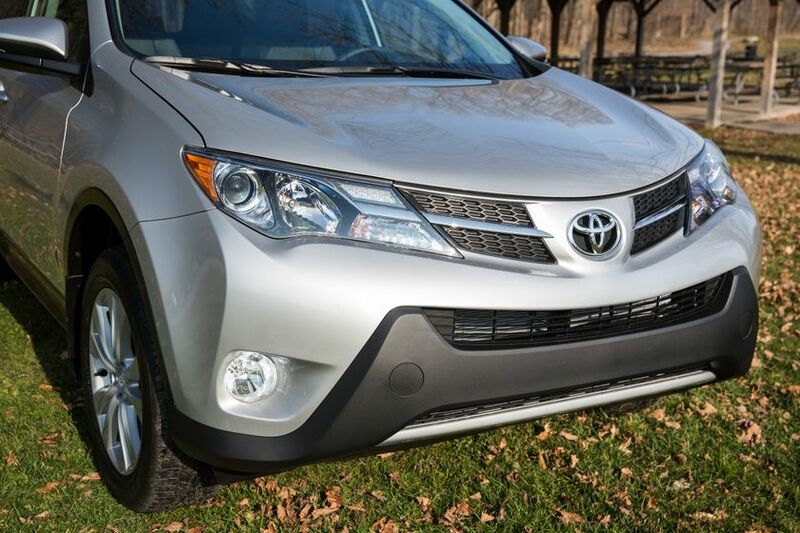 As on the front-drive RAV4’s, Sport Mode sharpens shift timing, throttle response, and steering response. 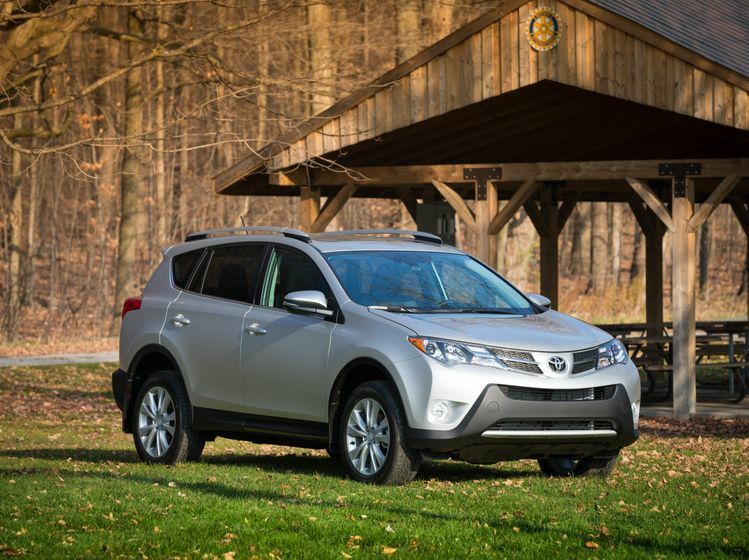 In RAV4 with AWD, Sport Mode has additional benefits. It can provide smooth and nearly instantaneous torque transfers between the front and rear wheels to help enhance cornering performance. Under certain conditions, Sport Mode can automatically deliver up to 50 percent of engine power to the rear wheels. 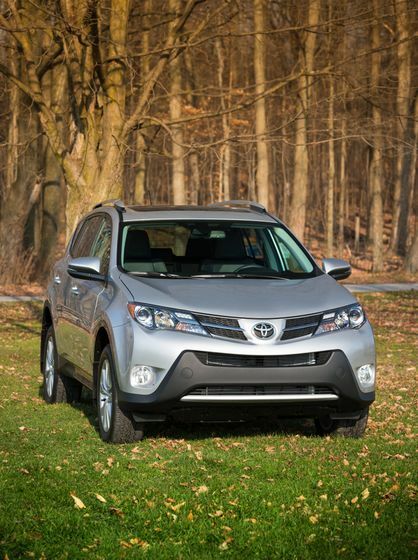 The new RAV4’s design achieves strong proportions while conveying the agile and fun character. Sophisticated and dynamic, the exterior features a progressive silhouette, with a sleek-sloping roofline and an aggressive character line. 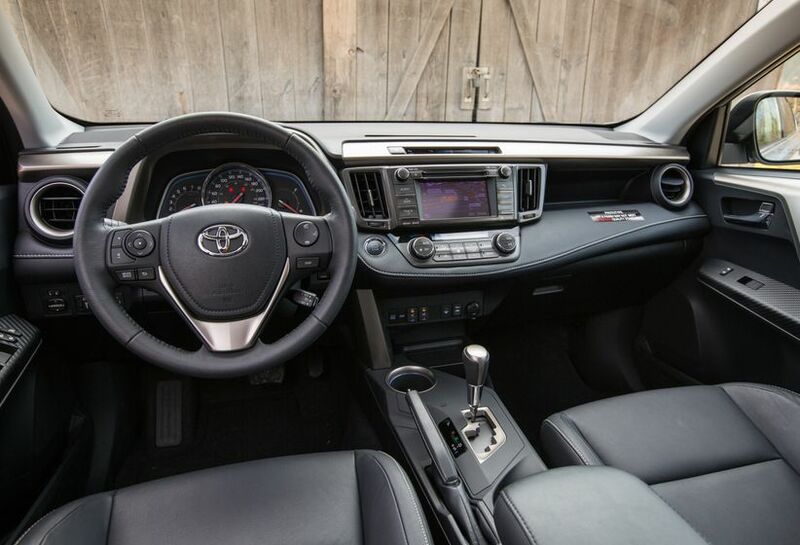 The new RAV4’s interior has a premium, sophisticated look with soft-touch accents and driver-centric controls. RAV4 pursues the design goals defined by Toyota President Akio Toyoda, with aggressively sculpted front and rear fenders and boldly proportioned taillights that define RAV4’s athletic presence. 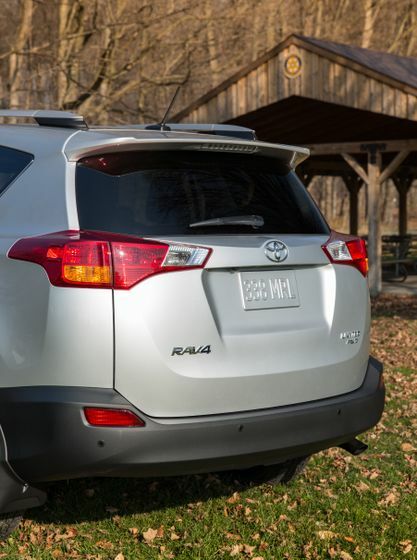 In a significant break with its heritage, RAV4 will switch from its side-hinged rear door to a convenient roof-hinged liftgate with a space-saver spare tire stored under the cargo floor. Standard on the Limited grade will be a one-touch power rear liftgate with driver-selectable memory height settings. 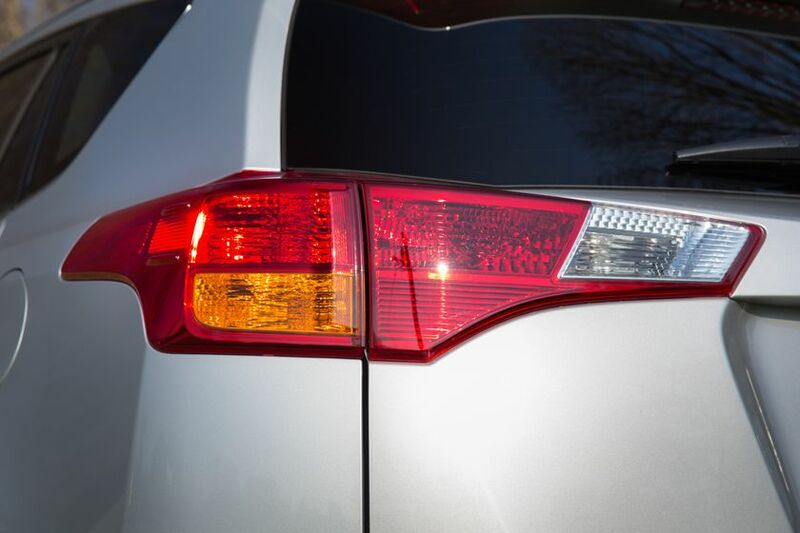 As on other recently introduced Toyotas, RAV4 engineers paid special attention to aerodynamics, the most obvious detail being small vortex generators molded into the taillight cases and near the base of the A-pillars. Less obvious are the aerodynamic undertrays beneath the passenger cabin that help smooth and control airflow. 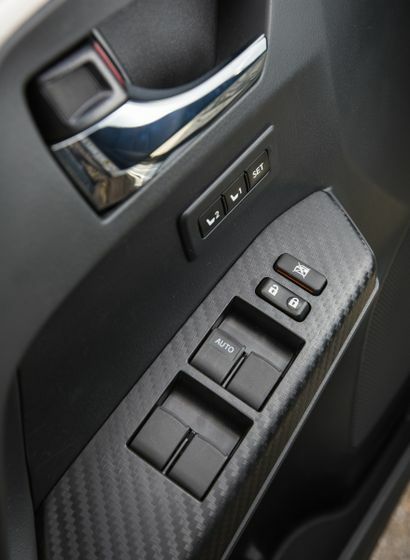 Following body-engineering principles debuted in the 2012 Camry and 2013 Avalon, RAV4’s body structure will include high-strength steel to help achieve several significant goals, including a robust and stiff platform that enhances steering and handling precision, and a body structure that is both strong and light. 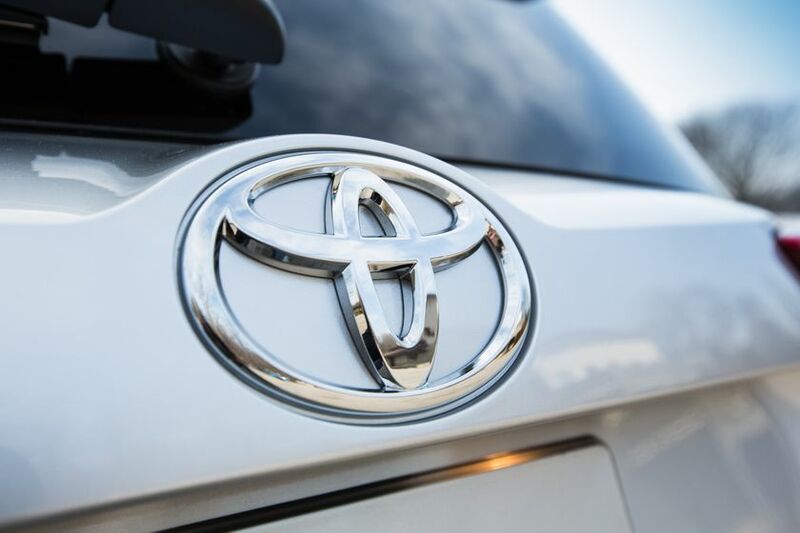 RAV4 engineers used several grades of high-strength steel to form key structural components in the roof, rocker sills, floor, engine compartment and door frames. The weight savings were in part invested in sound deadening materials and an acoustic windshield, helping to create a quiet passenger cabin. The new RAV4’s dash panel is driver-centric and asymmetrical, with primary and secondary controls all within easy reach. On the passenger side, the sculpted dash panel creates a sense of airy spaciousness. RAV4’s dash panel and gauges all feature clear blue illumination, which provides crisp visibility in most ambient light conditions, and a unified, coherent appearance at night. RAV4 will come standard with a manual tilt/telescope steering column, with the LE and XLE featuring a urethane steering wheel. The Limited grade will have a leather-wrapped steering wheel. 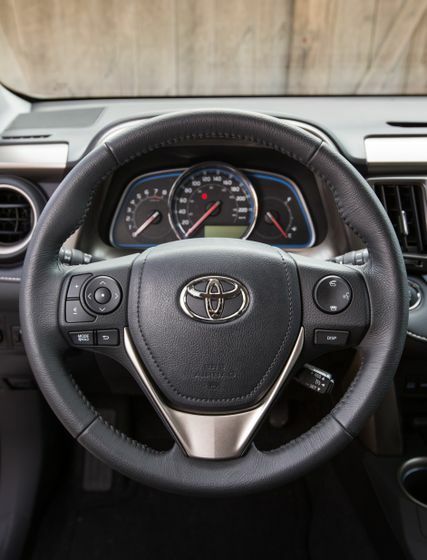 All RAV4 steering wheels will have controls for audio, Bluetoothâ hands-free phone and audio, and the Multi-Information Display (MID). 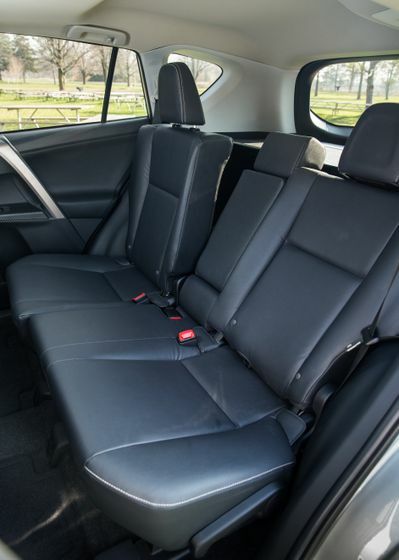 All RAV4’s will have driver and front passenger seats with high seatbacks and a slim back, enhancing rear-passenger knee room. The RAV4 LE driver’s seat is six-way adjustable, including seat height. 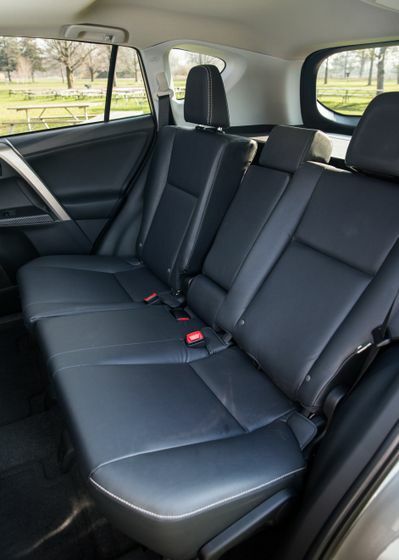 The RAV4 XLE driver and front passenger will ride in premium bucket seats with sport bolstering, providing ample support of the lower hips, lower torso and shoulders during cornering. The XLE will have premium fabric with French stitching on the seats and portions of the dash panels. The Limited will have the same premium driver and front-passenger bucket seats found in the XLE but will also come equipped with an eight-way power adjustable driver’s seat with memory, and driver power lumbar. 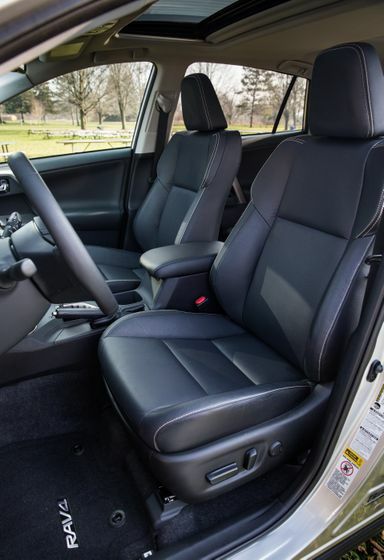 All RAV4 Limited seats are trimmed in high-quality, breathable SofTex with French stitching. SofTex also covers the center armrest, and portions of the door and dash panels. 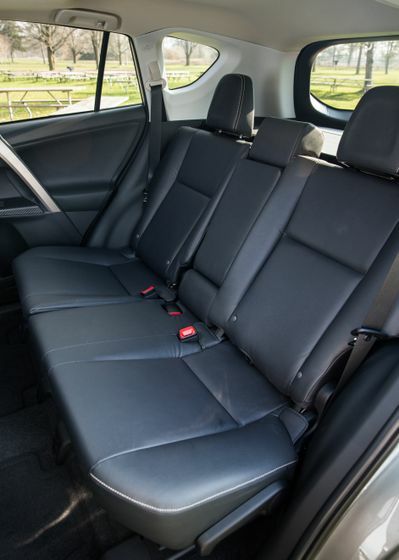 All RAV4’s will feature 60/40 split/fold second-row seats that recline several degrees to enhance passenger comfort. 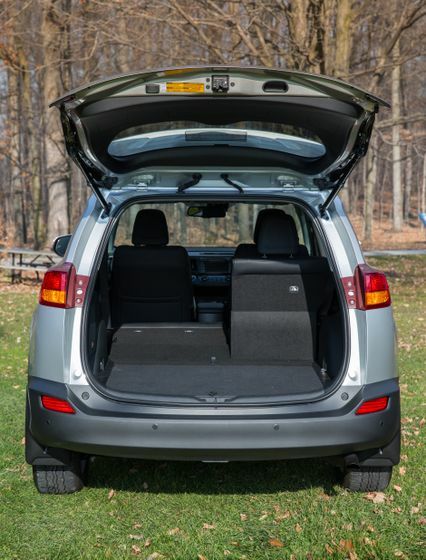 In contrast to 2013 RAV4’s compact exterior dimensions, the cargo area is deeper, larger and easier to access than in the previous generation, with just over 38.4 cu. 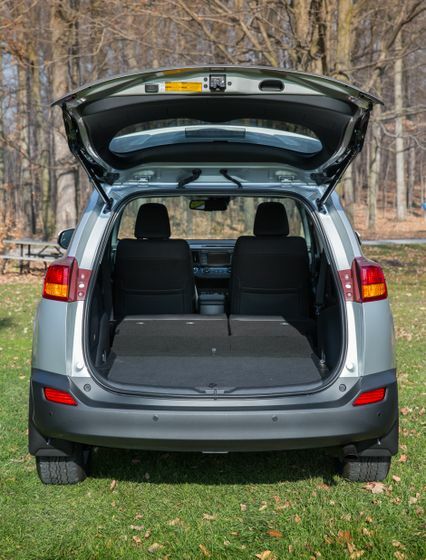 ft. of cargo capacity behind the rear seats. Privacy glass, Daytime Running Lights (DRL), cruise control, power side mirrors, power door locks and power windows are standard on all RAV4s. RAV4 XLE and Limited feature dual-zone automatic climate control, integrated fog lights, power moonroof with sliding sunshade, and heated outside mirrors with turn signal indicators. 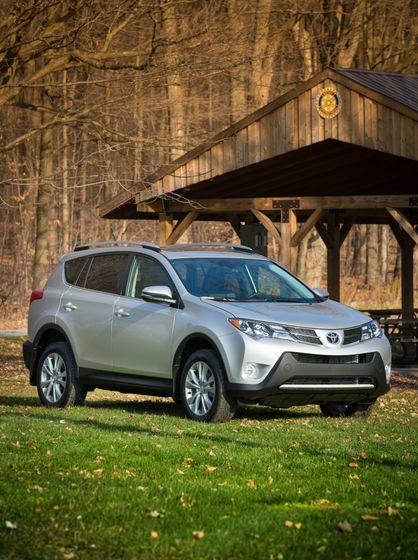 Available on all RAV4 models is a Display Audio with a 6.1-inch LCD touchscreen. Significant for this market, RAV4’s Display Audio includes a backup camera and Bluetooth connectivity. When shifted into reverse, the audio display will show the image of what the backup camera captures. XLE and Limited will offer an available GPS Navigation with satellite radio and advanced voice recognition. The Limited grade will also offer an available JBL® Premium Audio with 576-Watts of maximum power, 11 speakers, and GPS Navigation. The Limited grade will offer an available Blind Spot Monitor system (BSM). It can be turned off with a dashboard switch. When the system detects a vehicle in the adjacent lane, it alerts the driver with a blinking light indicator in the side mirrors. If the turn signal is on when there is a vehicle in the blind spot of the driver’s intended lane, the indicator on the corresponding mirror will warn the driver with a solid light. 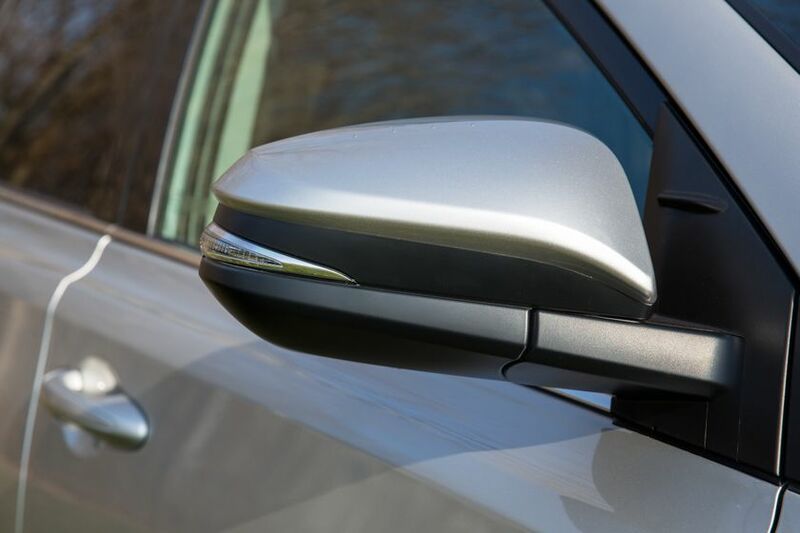 The available Blind Spot Monitor incorporates Rear Cross Traffic Alert (RCTA), which uses the Blind Spot Monitor radar sensors at the lower rear bodywork of the vehicle. 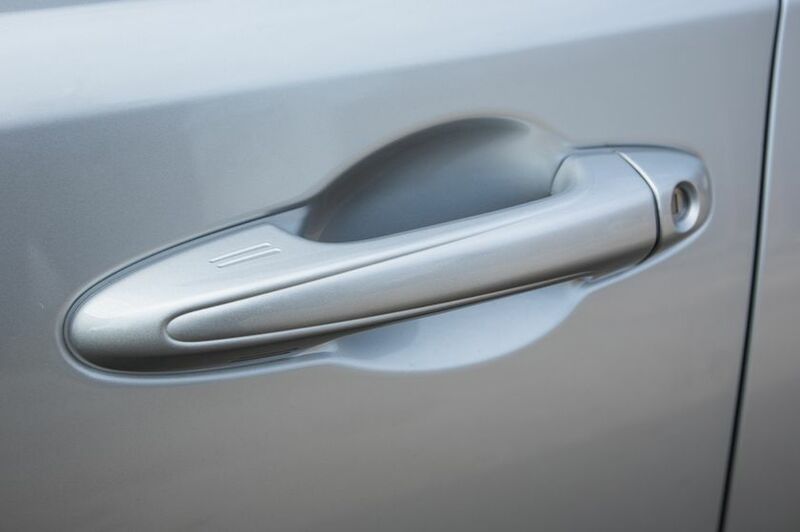 When backing up, the RCTA senses vehicles approaching from either direction and provides an audible warning combined with a flashing indicator in the appropriate outside mirror. 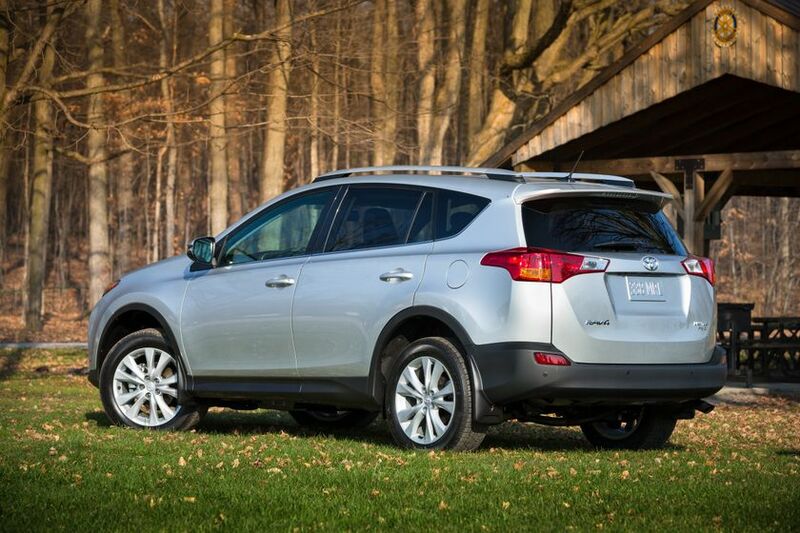 All 2013 RAV4s will have a class-leading eight standard airbags. 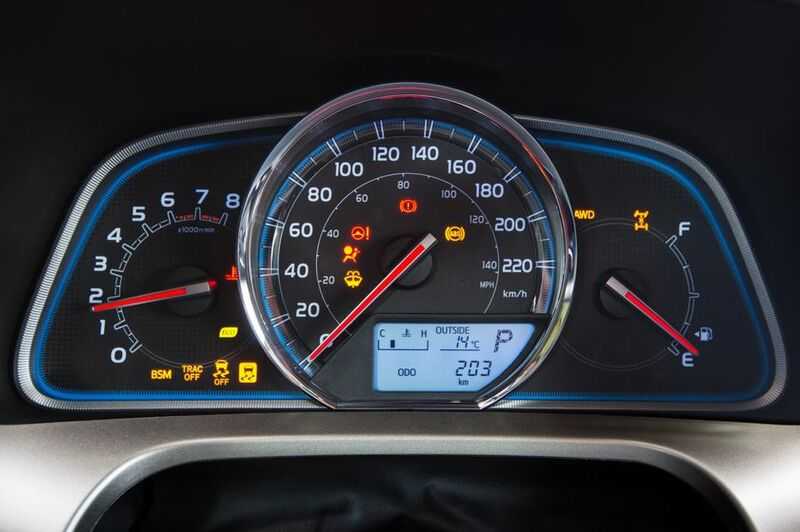 Like every Toyota, RAV4 will feature the Star Safety System, which includes Traction Control, Electronic Brake-force Distribution, Enhanced Vehicle Stability Control, Brake Assist, an Anti-lock Braking System, and Smart Stop Technology.